All-terrain, severe-duty traction and recovery performance in mud, sand, snow and ice. Fast, safe and easy vehicle recovery on all terrain types. High-flotation, aggressive traction surface for crossing bog and soft sand or snow field areas. All-metal aluminum construction provides rugged, durable, severe-duty performance for a lifetime of use in the worst conditions. Full replacement lifetime warranty. US-made. No pavement. No traction. No problem. Going beyond the pavement? Into the mud, sand, snow or ice? Don’t forget to pack the LinkTrac. Off-road, expedition, field services, or search and rescue, these require you to take your vehicle to places well beyond the predictable world of pavement and prepared roads. Traction is often not an option, so bring your own. Bring LinkTrac All/Terrain, the severe-duty, all-metal, all-terrain vehicle recovery, traction and bridging tool designed to quickly, safely, and easily give you the traction and bridging performance you require in mud, sand, snow and ice. Constructed from 6061-T6 aluminum, LinkTrac All/Terrain’s high-strength and lightweight modular design provides maximum traction on all surfaces, high flotation on soft terrain, and is bridging capable (optional LinkTrac Bridging Rails). Modular design folds for easy storage for 4x4s, UTVs and Adventure Motos. Includes LinkTrac Storage Packs for easy watertight storage. Variable lengths (35” – 55” or longer) and widths (5”, 10”, 15”) to meet your off-road, expedition and rescue recovery requirements. Select the size that best suits your vehicle type: 4×4, UTV, AWD or Adventure motor we have the length and width to meet your specific traction/recovery requirements and vehicle storage needs. Built for a lifetime of abuse and designed to outlast the vehicle driving over it LinkTrac All/Terrain comes with a full lifetime replacement warranty: If you break it, we will replace it. Period. 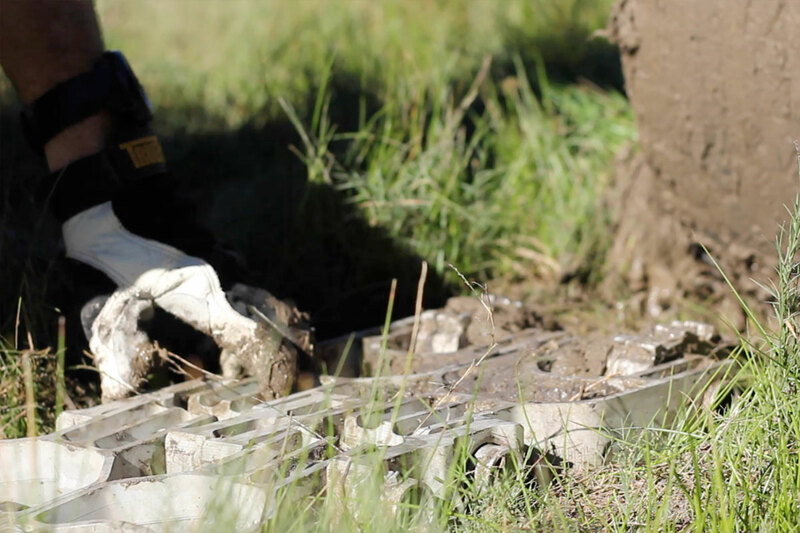 A severe-duty recovery and traction tool designed for a life beyond the pavement. Designed and made in USA, patent pending. LinkTrac All/Terrain is designed to provide maximum traction in all terrain types and on all surfaces. 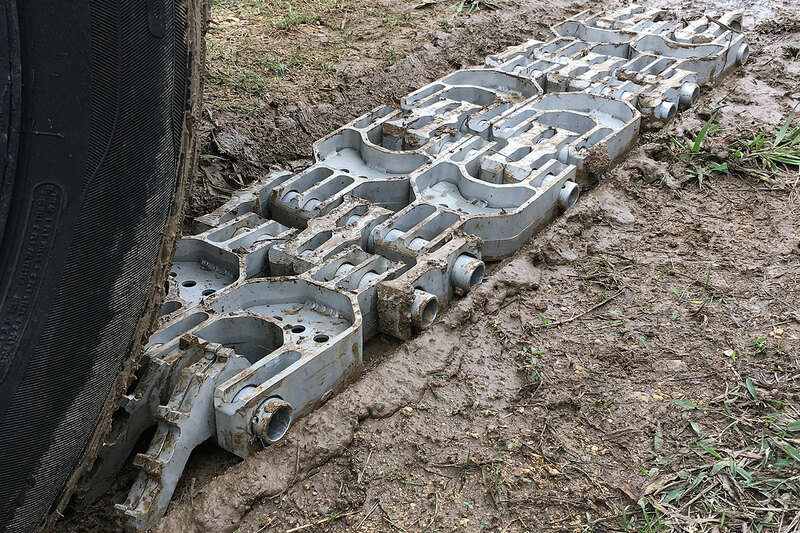 The modular link design allows LinkTrac to confirm to the terrain, soft or rocky, providing traction in places where rigid traction boards simply will not work. This flexible terrain complacent design conforms to the ground providing traction on slick rock faces, steep river banks, and high-angle ravines. The high-flotation design provides excellent mud, sand and snow performance preventing the vehicle from sinking into the terrain. The modular design allows you to quickly join tracks into longer continuous lengths to provide surfaces across soft mud, sand and snow terrain to prevent the vehicle from becoming stuck. Optional steel ice cleats provide solid grip between LinkTrac and ice surfaces providing predictable, safe traction across ice and broken ice surfaces. All LinkTrac All/Terrain systems include LinkTrac Storage Packs for easy, waterproof, no-leak storage. Why is metal construction important? Severe-duty strength, durability, and performance in all conditions, on all terrain types. LinkTrac is constructed from 6061-T6 marine-grade aluminum to provide high-strength performance and rugged durability. The aggressive extruded aluminum links provide excellent tire grip for traction with no damage from tire spinning. Use LinkTrac on soft terrain or on uneven rock surfaces with no risk of breakage, it is designed for long-term abuse, year after year, and will likely outlast your vehicle. The lightweight aluminum construction also provides ease of use in the field and ease of storage when the recovery is completed. Weight for a single 10” x 45” (25 x 114cm) LinkTrac is 20 lbs/9 kg. The all-metal design is backed by a 100% lifetime replacement warranty. If you can break it, we will replace. Period. LinkTrac All/Terrain provides a high-strength, severe-duty recovery tool that is fast, safe and easy to use. 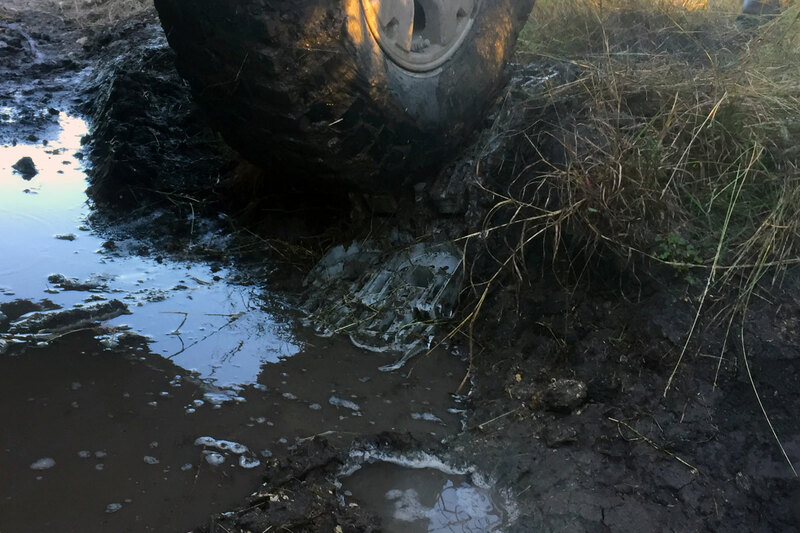 When you find yourself stuck off-road you are not only working to quickly get the vehicle recovered and back underway, but you are working against your own fatigue. LinkTrac deploys quickly with out the need for tiresome and time consuming digging required to properly position rigid traction boards. With LinkTrac a vehicle recovery typically requires less than five minutes. No digging required. 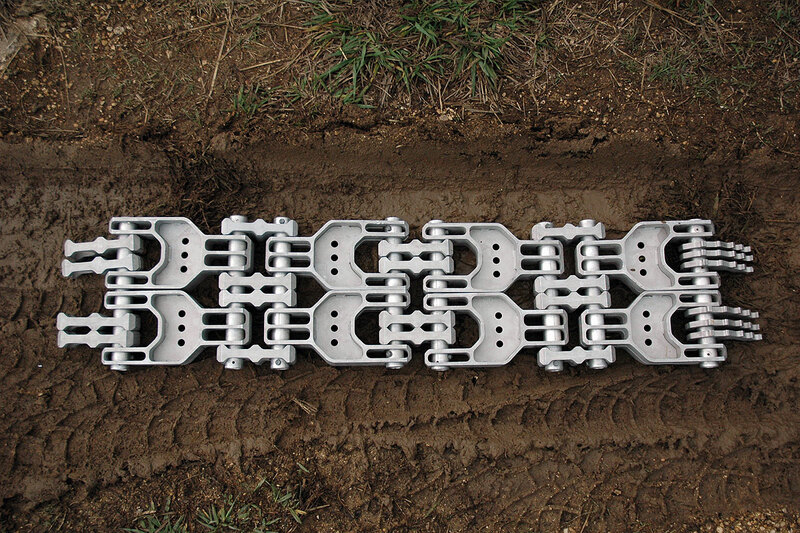 Our flexible link design also dramatically improves terrain traction by allowing LinkTrac to conform to the terrain, providing continuous contact between the tracks and the ground below. This continuous contact means LinkTrac performs in ALL terrain types, up ridges, over slick rock faces, in deep ravines, in many place rigid traction boards just will not work. LinkTrac is so effective that it reduces the needed to use recovery winches and other potentially dangerous pieces of recovery equipment keeping you safe. And when the recovery work is done simply fold up LinkTrac, secure them in the waterproof LinkTrac Storage Packs and store in the vehicle or on your cargo rack. Fast, safe and easy! 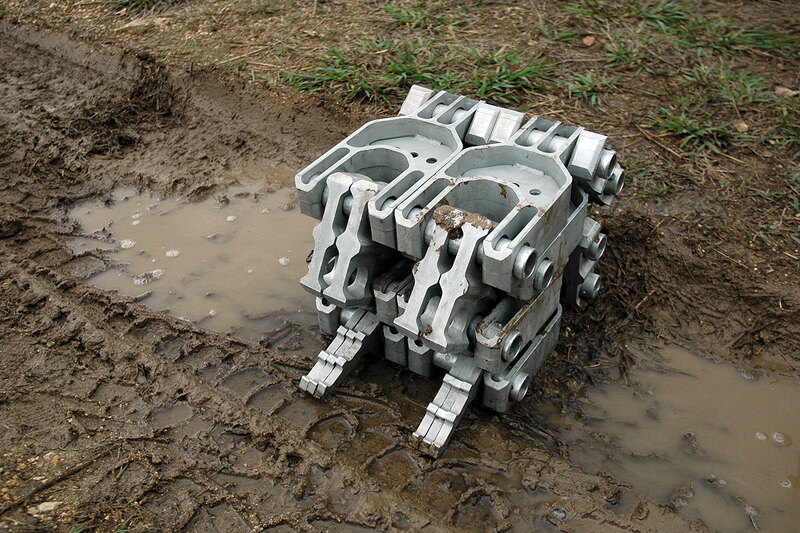 LinkTrac’s modular design provides excellent terrain complacent traction on all terrain types and surfaces. This modular design also gives LinkTrac the unique ability to change dimensions to meet your specific vehicle and terrain requirements. Using basic hand tools you can quickly and easily change the length your LinkTrac. Starting with our 10” x 35” model you can quickly and easily add length (in 10” sections) to 45”, 55” or as long as you need (in 10” segments). You could literally have 10” x 305” versions for use as a temporary traction surfaces in heavy bog and soft surface areas if needed. 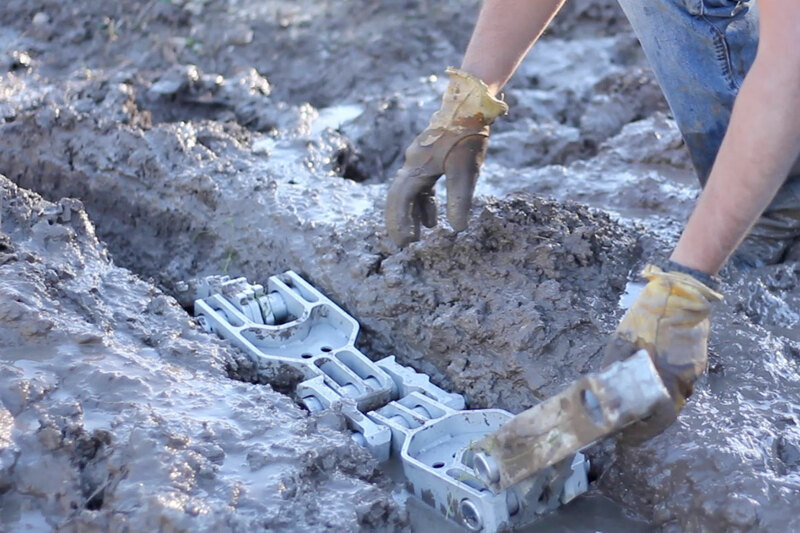 And by changing the hinge pins you can also adjust the width of your Linktrac from 5” to 10” to 15” giving you the freedom to configure the traction and recovery tool you need without the need to buy multiple sets of rigid traction boards. Need higher floatation in soft surfaces? Go wide with a 10” or 15” width track. Lighter vehicle or smaller storage space capacity? Go narrow with a 5” track. Working on a budget? 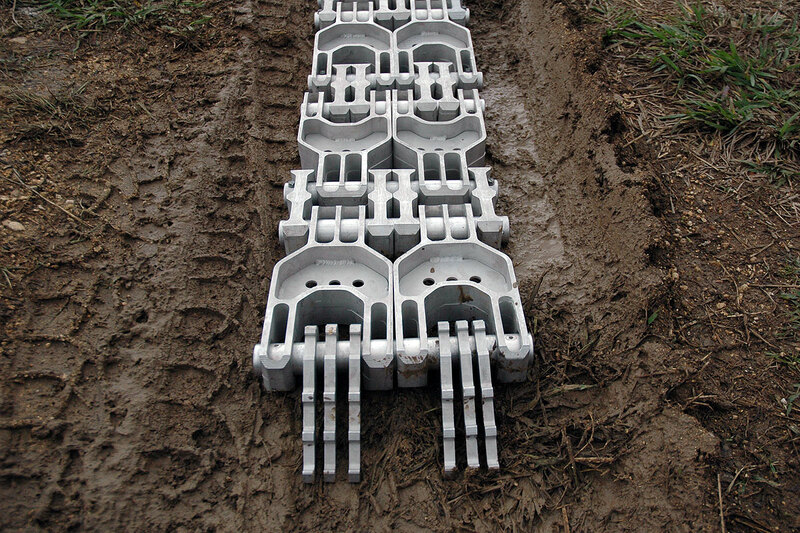 Start with a pair of our 10” x 35” tracks and then simply upgrade to 45” or 55” lengths as budget permits. By changing hinge pins you can easily reconfigure your larger 10” x 55” tracks to 5” x 55” tracks. All sections and hinge pins are easily swapped using basic hand tools and a few minutes of time. LinkTrac’s modular design and variable length and width allows you to create the traction and recovery tool you need to match your specific vehicle requirements. A larger vehicle, such as a 4×4, has a higher overall weight and will require more floatation for soft surfaces. The 10” width LinkTrac is a perfect option for these vehicles. And for the extra heavy 4×4 vehicles (15,000+ lb), the 15” wide version will provide the additional floatation required on soft surfaces. The lighter and extremely off-road capable UTVs / Side-by-Sides have a much lower overall weight and require much less floatation, but are limited in the cargo capacity area. Carrying full size rigid traction boards is often not a convenient option. For these vehicles the 5” width LinkTrac is an ideal choice, providing excellent soft surface floatation with the convenience of easy storage with to LinkTrac’s folding design. At the extreme we have the Adventure Motos. Lightweight and highly capable these vehicles easily get into difficult terrain. They require minimal floatation, but are very weight and cargo sensitive. A single 5” width LinkTrac (35” or 45”) makes for a very capable recovery and floatation option that folds down for a lightweight and small cargo footprint. No matter what your vehicle choice LinkTrac provides an ideal dimension option to meet your needs and with our modular design you can easily reconfigure your LinkTrac depending on the vehicle being used. By changing hinge pins you can easily reconfigure your 10” x 55” used for your 4×4 down to a 5” x 45” using basic hand tools and our 5” Hinge Pin Kit. Traditional all-metal recovery boards, commonly known as sand ladders, offered not only solid traction and floatation in soft surfaces, but they also provided the ability to bridge relatively large terrain gaps (55” or greater) and ramp up steep terrains (ridges and ledges). The current selection of plastic traction boards, while lightweight and convenient to use in soft surfaces have lost this useful bridging capability with their more flexible materials and shorter length. And while not a requirement for everyone in an off-road scenario, having this capability when needed can prove to be major convenience. Our optional LinkTrac All/Terrain Bridging Rails bring back this highly useful bridging capability. 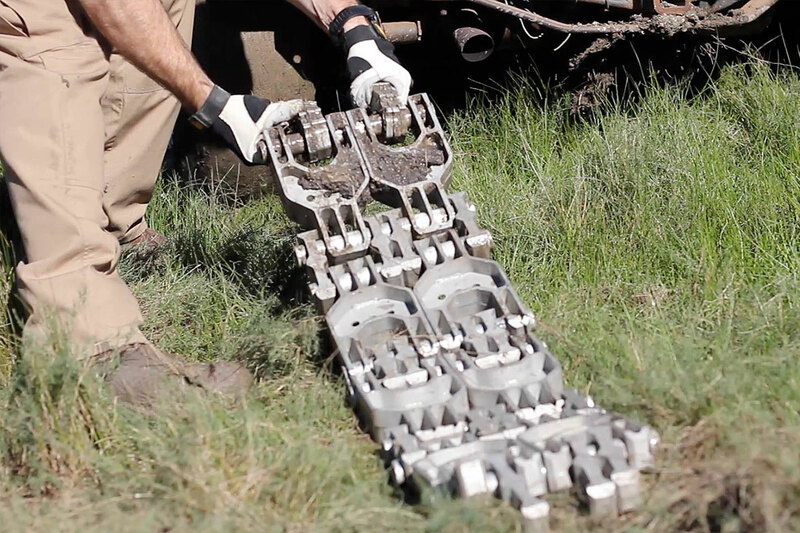 These detachable and foldable components give the normally flexible LinkTrac All/Terrain the rigidity to span gaps up to 55” (with a 10,000lb vehicle). Extruded from high-strength and lightweight 6061-T6 aluminum can be attached or detached in minutes using basic hand tools and fold for easy in-vehicle storage. Look for details soon. Compatible with 5” and 10” width versions of LinkTrac and available for 45” and 65” lengths. Traditional metal traction boards (sand ladders) were extremely tough and durable. These recovery tools would hold up to endless abuse and misuse, coming back for more time and again. 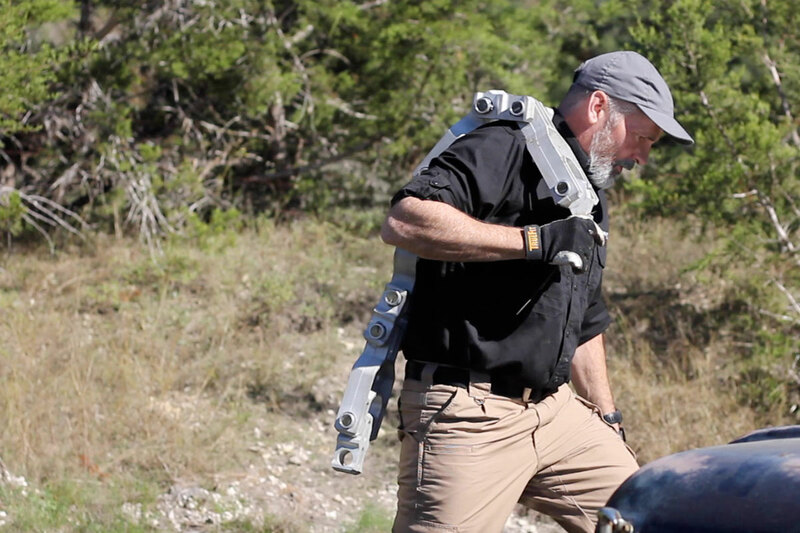 At Pronghorn Overland Gear we respect that level of performance. We believe in making the best gear we can with zero-compromises. Gear that will perform time after time in the worst terrain without fail. 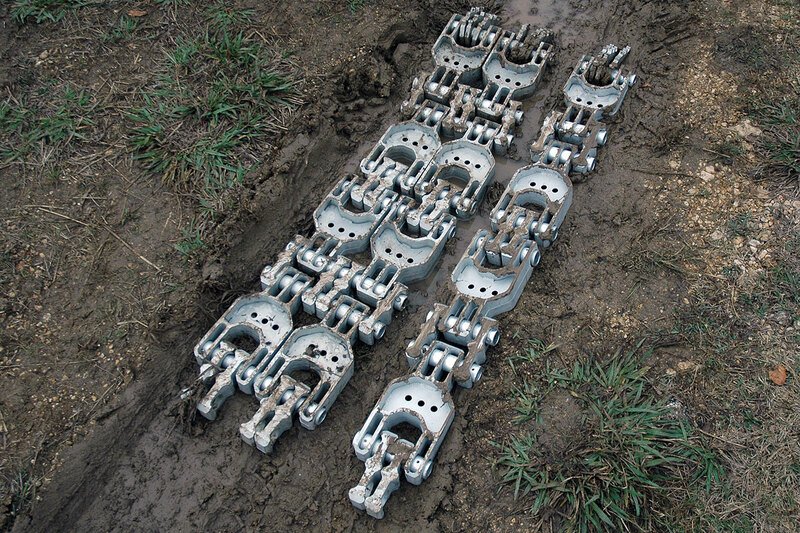 Our USA-Made, all- metal, severe-duty LinkTrac All/Terrain brings that level of durability and long-term performance and carries a warranty that says we believe we are building a product designed to outlast the vehicle you are using it with. Maybe even outlast you. We offer a Full Lifetime Replacement Warranty for LinkTrac All/Terrain, LinkTrac Storage Packs, and LinkTrac Bridging Rails. And our warranty is simple: If you can break it. We will replace it. Period. All LinkTrac components are designed and made in the USA. Patent pending. Full Warranty: If you break it, we’ll replace it. Period.